The Pittsburgh Penguins won a roller coaster of a game Monday night, coming back from a 3-1 deficit to defeat the Columbus Blue Jackets 4-3. So far in this series, a team has blown a 3-1 lead in every game. The Pens are not playing anywhere near their best hockey but somehow they still lead the series 2-1. Perhaps the most amazing play of the game, was the goal scored by none other than Brooks Orpik. 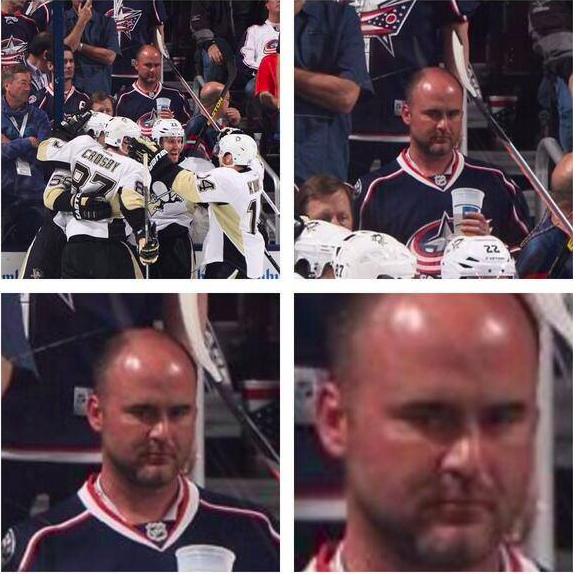 Orpik toe-dragged around a Blue Jackets player and riffled a wrist-shot to make it 2-1. Orpik was one of the best players on the ice, even if you don't include that goal. The Pens scored three goals in the third period to take the lead, then weathered the storm at the end of the game. Brandon Dubinsky had a great drive to the net and almost made young Pens fans cry by tying the game. Luckily, Jussi Jokinen and Orpik were there to make a great defensive play. I still almost pooped though. The Blue Jackets have feel deflated, as they have thrown everything but the kitchen sink at the Penguins, and still trail the series 2-1. Our friends at Kiss FM, Mikey & Big Bob got the big screen crowd doing the Yes chant through the night at Consol. Pens will take on Columbus in game four Wednesday night, then hopefully can try and wrap up the series this Saturday night in Game five. In news regarding former Penguins players, Matt Cooke went back to his old ways, committing one of the dirtiest plays of the playoffs so far. Yikes. You have to expect Cooke to be suspended for that, given his history and reputation. Even though I am a Cooke fan, I can't even try to defend that play.